As a student and budding scientist at the Massachusetts Institute of Technology, Brother Guy Consolmagno used to wake up on Tuesday mornings excited to start his day. He was eager for a class on meteorites. "You're touching bits of outer space," Consolmagno, now 54, said in an interview, holding out his hand as if his empty palm was filled with a rock propelled from the heavens. "It's as good, sometimes better, than moon rocks." The self-professed nerd would go on to combine his love for the physical world with a passion for the spiritual one. Now, as a Vatican astronomer, Consolmagno spends much of his time talking to fellow astronomers, nonscientists, clergy, kids and skeptics about how science and faith, despite public perception, coexist. Consolmagno says many Catholics have been taught that Catholicism and science don't mix, though they always have. The Big Bang theory that the Earth originated in an extremely dense and hot space and expanded was developed by a Belgian priest. Though many people believe that Galileo was shunned by the Church for saying the sun was the center of the universe, he was close to many church leaders. Consolmagno said church officials don't advocate for a strict interpretation of the book of Genesis, which includes the Christian creation story. "The cosmology of Genesis is not only not the cosmology of the 21st century. It wasn't even the cosmology of the second century," he said. "The Romans knew that the world looked different from a flat plane with a bowl over it and water above and below. And that didn't seem to bother them." The conflict between evolutionary science and creationism in the United States comes from the Protestant tradition, not the Catholic one, he said. "American Catholicism is in a Protestant culture," he said. "We borrow a lot of our attitudes, along with a lot of our hymns, and not always the best of either." Instead of being at odds with each other, God's universe and physical reality are one, he said. He often is asked if the Church will meet its downfall if intelligent life is found on another planet. Consolmagno argues that such a discovery would only heighten the mystery of the Catholic God. "It will help us remember that we're not as clever as we thought we were," he said. Read more. "At one point I wondered why was I wasting my time doing astronomy when people are starving in the world - a little voice of conscience. So I joined the Peace Corps. While I was there, I discovered that I loved teaching. But mostly I discovered that the people in Africa, the people in Kenya, where I was, wanted to know about astronomy. That's what they wanted from me. And they were as fascinated and as excited about it as I was, as anyone in America." "And I understood then why it's important. It's one of those things that makes us more than just well-fed cows. It satisfies a really deep hunger to know, to go someplace, to explore. And that is a hunger that is as human, as basic to human beings as food and shelter and anything else. And it's denied to a person only at the cost of denying them their humanity. By telling poor people, "No, no, you have to go hunt for food, you can't do astronomy," you are saying that they're less than human. And that's wrong. And it's a tragedy." "When I came back from the Peace Corps, I taught for four years, and enjoyed it so much I decided to teach full-time. And so I entered a teaching order, the Jesuits. What I didn't realize was that they were going to pull me out of teaching to do full-time research at the Vatican. There's a small group of about a dozen Jesuits at the Vatican. I'm one of them. We come from all over the world. We all do just full-time astronomy. But in addition, I do a lot of public talks and things like my participation in this conference." Read more. Scientific theories must do more than merely satisfy the data. They must do so in a way that is “elegant.” For example, when Einstein once heard that a rival scientist had completed experiments that disproved much of his Theory of Relativity, the renowned genius simply said, “He must be wrong,” Consolmagno said. “Einstein held his theory was true because it was so elegant, it fit together so well, that it had to be true,” he said. Science is not “literal,” Consolmagno said. It’s “poetry and metaphor” for how the universe works. “The same God who came to save you, an individual, created individual molecules, atoms and electrons,” Consolmagno said. “When I’m doing science, I’m playing with God.” Read more. 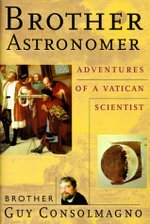 Learn more about Vatican Astronomer Guy Consolmagno.